The new platform dubbed JETLASER is available in two power levels of 200 W and 500 W average laser power and is optimized for manual use or integration with a robot. The end effector was designed to offer improved ergonomics and safety. 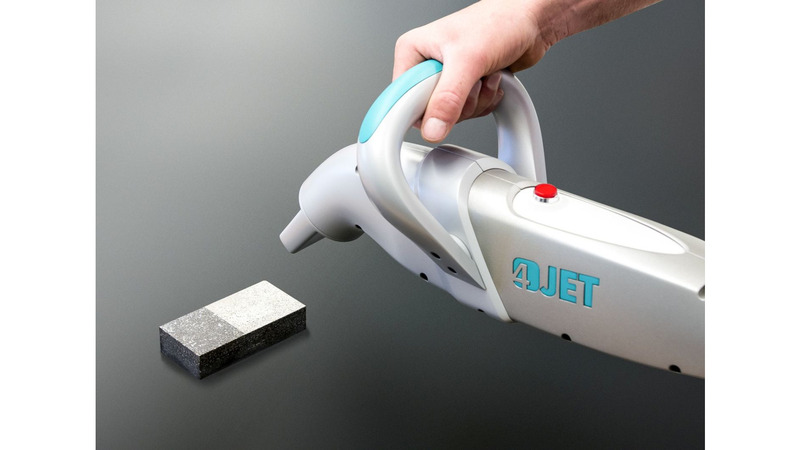 Other than conventional single hand devices that work similar to a gun, the new 4JET system is based on a two-hand operation that provides for a more comfortable processing. Powered by fibre-coupled, maintenance free solid state lasers and integrated into a rugged mobile cabinet the system addresses a vast range of industrial cleaning operations. Potential applications include cleaning of molds, tools and fixtures, paint and coating removal operations and pretreatment of surfaces prior to welding, glueing or coating applications. The 3D printed enclosures enable an extremely light weight. 4JET product manager Thomas Weingartz comments: Flexible laser cleaning systems add perfectly to our portfolio of fully automated machines. With the JETLASER platform we now offer handheld entry level solutions for customers that have a diverse range of cleaning tasks or low production volumes. As these requirements grow, we can offer our highly advanced solutions for customized fully automated processing systems. The product is supported by 4JET s extensive global service structure. The company is also seeking interested distributors and service providers who want to expand their offering.